Best of Long Island and Central Florida: The Summer of Love has lasted 46 years in their house. The Summer of Love has lasted 46 years in their house. The story of the lady in the photo.Especially liked her comment referencing that the festival dedicated to peace and ending the war has a Marine on the cover. Really not astounding, as the rate of service was higher then, but still interesting. Very interesting read, Linda. I can remember all the stories about Woodstock. 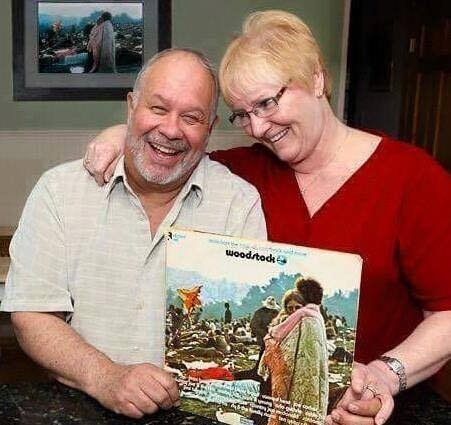 It is amazing that this man helped change her life and they are together after 46 years. This brings back many memories of life back then. I remember going to the Newport Jazz Festival with my girlfriend in her little yellow VW. She had a stick shift and I didn't know how to drive one. She wanted me to help with the driving. Ugh, what an experience that was. I also like how the photo has a butterfly on the staff. Makes my day. How wonderful to find a love that lasts.